BEIJING Foxconn Technology Group denied on Saturday that production was affected at a Chinese factory that makes Apple's iPhones, although both state media and an overseas labor watch group said some workers halted production lines on Friday, apparently over higher quality control standards. New York-based China Labor Watch reported that 3,000 to 4,000 workers at the Foxconn plant in the central China's Zhengzhou city went on strike Friday over increased quality control demands and having to work during an extended national holiday. The official Xinhua News Agency, quoting a spokesman for the management committee of the Xinzheng Comprehensive Bonded Area where the plant is located, said some production lines were halted Friday when workers persuaded quality inspectors to skip work to show their dissatisfaction over higher quality standards. In a written statement issued Saturday, the Taiwan-based electronic manufacturer Foxconn said production at the Zhengzhou plant continued without interruption. It denied any strike or work stoppage. Foxconn said there were two isolated, small-scale disputes between production line workers and quality assurance personnel on Monday and Tuesday, but it added that they were quickly addressed. It did not specify what issues had caused the disputes but said immediate measures were taken to resolve the problems, including adding production line workers. Xinhua said some workers were unhappy when Apple strengthened quality inspections of the iPhone 5 following consumer complaints regarding aesthetic flaws in the phone. In the Xinhua report, the spokesman  who was not named  characterized the incident as a worker-management dispute instead of a strike and was unable to provide a specific number of workers involved. China Labor Watch said several iPhone 5 production lines at the factory were paralyzed after the workers found the new quality control demands difficult to meet and went on strike. The group said the workers also were angry about being forced to work through China's National Day Golden Week holiday, which ends Sunday. The iPhone 5, the latest in the line of the smartphones, debuted in September. China Labor Watch said the Foxconn workers were required to work during the eight-day holiday from Sept. 30 to Oct. 7 to meet the production demand of iPhone 5. 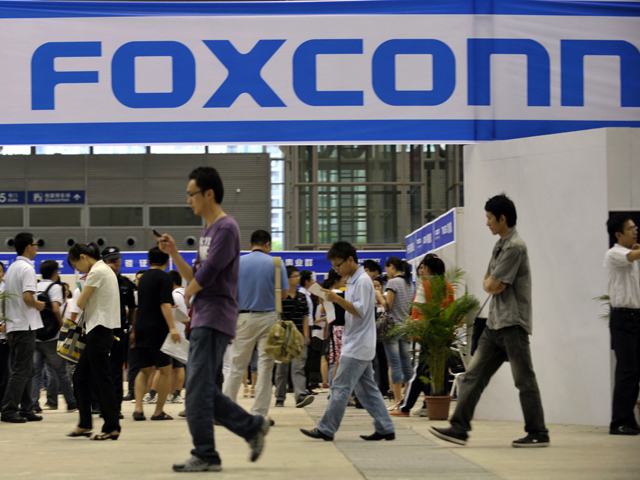 Foxconn said its employees in China who worked during the holiday did so voluntarily and were being paid three times their normal pay, in accordance with Chinese labor law. China Labor Watch said workers also beat quality control inspectors, who carried out their own work stoppage after management ignored their complaints. According to China Labor Watch, Apple and Foxconn had imposed stricter quality standards regarding indentations and scratches on the frames and back covers of the iPhones but did not provide workers with proper training to meet the new demands. In late September, a brawl involving 2,000 workers broke out at Foxconn's factory in the northern Chinese city of Taiyuan, highlighting chronic labor tensions in a country that prohibits independent unions. Labor activists have said the rollout of the iPhone 5 has led to longer working hours and more pressure on workers.